Dare to resist our devilish selection of nuts, tea pack and fruit. Sometimes you just have to yield to temptation. Nothing brightens up a work week better than this delightful basket full of fresh fruits. Great for office or home. 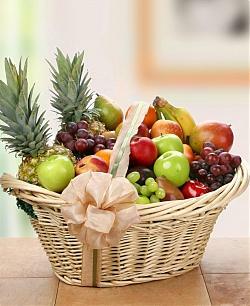 Components May Vary - Apples, bananas, oranges and pineapple in a basket(10 items) with chcolates.